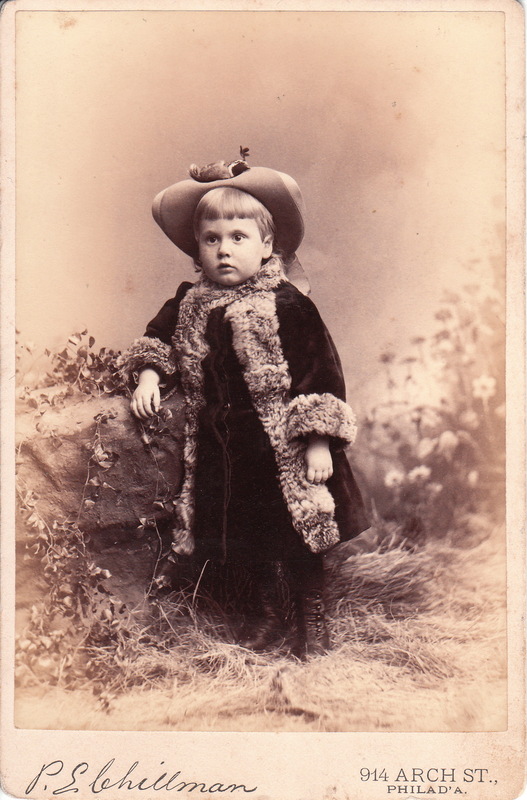 This original cabinet card portrait features a ten year-old boy named Eddie. His name and age are pencilled on the bottom and reverse of the photograph. Young Eddie does appear to be having fun while being photographed. He is adorably dressed. Note his high boots, bow tie, and cute hat. The photographer and the location where the photo was taken are unidentified. This cabinet card photo is in very good condition (see scans). This cartes de visite portrait features a smiling barefoot little girl dressed as a geisha. She is holding an Asian style umbrella. Geisha girls are Japanese women who are entertainers. They perform ancient traditions of art, dance, and song. They wear traditional costumes and make-up. There was a time that geisha fashion was popular in the Western world. Both adult women and young children, in the west, would wear this Japanese fashion. It is not uncommon to find cabinet card era (late 19th and early 20th century) photographs of Western women wearing kimonos. This cdv photograph measures about 2 5/8″ x 3 5/8″ and is in very good condition (see scans). A cute little girl with curly hair poses in a studio created field of daisies for photographer Sim Mould. The studio was located in Baraboo, Wisconsin. The girl is wearing a dress wth a lace collar and has a flower pinned to the front of her dress. An inscription on the reverse of the cabinet card indicates that the child’s name is Hattie Acot. Unfortunately, no biographical information could be found about her. The photographer, Mr. Mould is mentioned in a number of photographic journals. He placed an ad for his studio in a book about Sauk County, Wisconsin (1891). The Photographic Times (1898) reports on his appointment to a lobbying committee of the Photographers Association of Wisconsin. The Encyclopedia Dubuque (1911) reveals that Sim Mould operated a photographic studio at 107 Main Street in Dubuque, Iowa. The town of Baraboo is situated on the Baraboo river. The town was settled by Abe Wood and originally called Adams. In 1852 it was renamed Baraboo. In the town’s early history it became the home of several sawmills. In the nineteenth century the town served as the headquarters of several circuses, including Ringling Brothers. Baraboo became known as “Circus City”. This cabinet card portrait is in very good condition (see scans). A lovely young couple pose with their baby and their dog in a family portrait photograph. It is not clear whether the photo was taken outdoors, or in a photo studio. Writing on the reverse of the postcard indicates that the message was written in 1913. The postcard was sent to someone in Paris, France. This postcard is in very good condition (see scans). This vintage photograph features an adorable little girl holding a teddy bear. She is wearing a large bow in her hair. The child is looking at the photographer but clearly not feeling especially comfortable. The photo measures about 3 3/8″ x 5″ and is in excellent condition.